Great Ocean Pools was born out of a need for cohesion between the pool builder and the landscape contractor. The staff at Great Ocean Pools are also involved in our landscape construction company, Winstanley Landscapes Pty Ltd which has been building award winning landscapes since 1991. Many years ago our landscape teams were introduced to sites after the pool had been built by others. Unfortunately in many circumstances the full potential of the backyard was compromised and quite often needless dollars were spent on moving services and underground pipes due to lack of planning and co-operation between all parties. Our approach is to work with a design before any soil is turned. In every situation there will be issues involving items such as pool fencing, pool equipment location, drainage, paving and decked areas. We have longstanding relationships with the following designers who are very familiar with all processes involved in designing your pool and landscape surrounds. 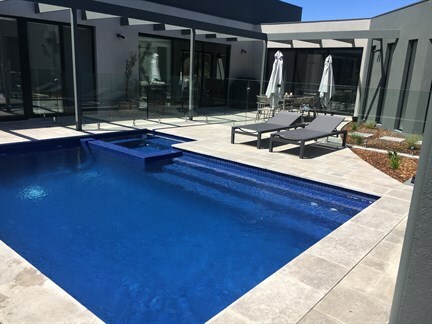 In Melbourne, David Bennett from Gardens and Pools by Design and for Geelong and the Surf Coast, Derek Weigall from Facet Design can design the pool and landscape to suit your needs and budget. Alternatively we are more than happy to work with your own design provided all criteria are met for us to submit plans to get your Building Permit Approval. We will take care of the pool engineering and Building Permit. From then on we will ensure that appropriate measurements and levels are followed. If interpretations are required for pool fencing legislation, then we will follow up on this. From the moment we start excavating, we will be in constant contact with all parties regarding pool surrounds to ensure that there is no needless double handling and to ensure that the time lines are met. If our landscape construction team is used then our staff will be familiar with all processes. We are also happy to work with other builders and trades and will ensure that communications are clear. Upon completion of your pool, we will service your pool free of charge for the first 2 months and then will always be available for advice from then on.